The Albany Law Review is hosting justices from state supreme courts from around the country and the New York Solicitor General at the Eighth Annual Chief Judge Lawrence H. Cooke State Constitutional Commentary Symposium. 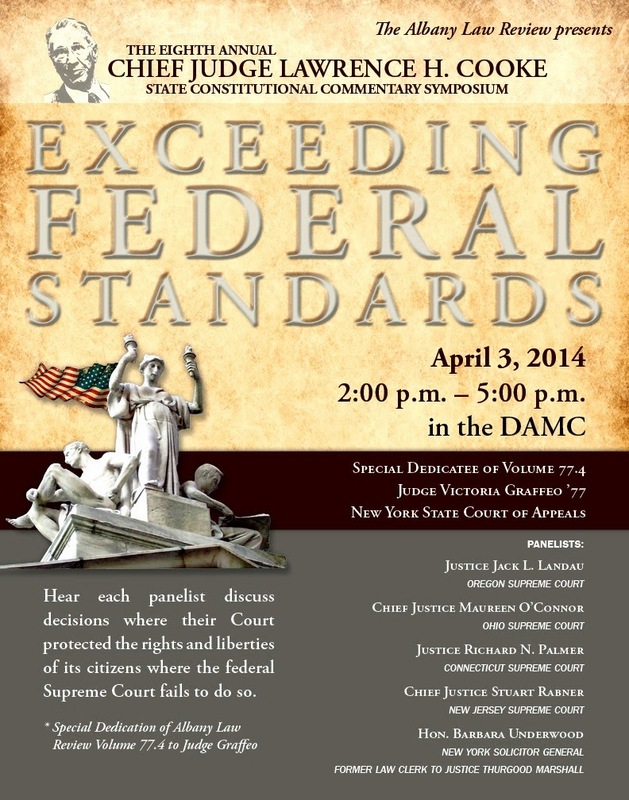 The panelists will discuss cases in which their supreme courts interpreted state constitutions to provide greater rights and liberties than their federal counterparts. These cases include topics such as marriage equality, protections against governmental takings, free speech, and freedom of the press. In the Spring of 2007, the Albany Law Review inaugurated an annual tradition of honoring former Chief Judge of the New York Court of Appeals Lawrence H. Cooke by holding the State Constitutional Commentary Symposium in his name. In that first year, the Symposium featured the Chief Justices of the Supreme Courts of Arkansas, Utah, and Wisconsin, as well as a tribute to the Chief Judge of the New York Court of Appeals, Judith S. Kaye. WHEN: Thursday, April 3, 2014. The event begins at 2PM with a reception following.